NOVEMBER 2017 • E&MJ 69 www.e-mj.com OPERATING STRATEGIES system that enables standardization of concepts and indicators throughout the company's business units. The complete operational status and experience of these units will be available in a single database, facilitating the replication of best practices and internal benchmark- ing, making the decision-making process more dynamic and competitive. "Over the years, Vale has acquired several companies and each one adopt- ed its own system. For the fi rst time, we are standardizing all these systems," ex- plained Jonas Chagas, project manager. "Now we can more easily compare the performance of our units, thus identify- ing process improvement points to enable increased productivity," added Marcelo Baltar, ferrous information manager. GPV-M is capable of processing 1.2 terabytes of information in real time while serving a large population of users. Vale said that since the beginning of its de- ployment, the system has been accessed by a thousand different users — up to 150 simultaneously. And, as the compa- ny noted, because the MES is the intel- lectual property of Vale, it will be possi- ble to constantly expand and extend the system and incorporate new functions as indicated by analysis of information gen- erated from its use. Overall, Vale said it is investing in in- formation technology to become a less complex, more effi cient and competitive mining enterprise. The initiatives aim to integrate the company globally, reduce costs, simplify processes, and impact the business strategically, in order to boost company-wide productivity and achieve top-level health and safety indices. 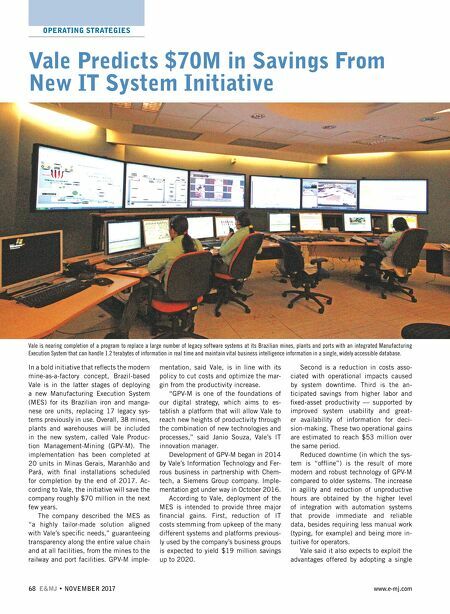 The company said it is deploying intel- ligent systems for supply chain planning. This includes industrial IT solutions, such as fuel and fl eet management sys- tems; advanced data analysis, in order to foresee problems, anticipate equipment failures, and infl uence decision-making; and mobility solutions, such as mobile applications that streamline supervisory decision-making and process develop- ment throughout the company. Easy Integration With AutoMine Tele-remote Sandvik recently debuted its AutoMine Tele-Remote for underground loaders, described as a new smart entry-level addition to its AutoMine product fami- ly. AutoMine Tele-Remote, according to the company, provides a useful intro- duction to the full potential of Sandvik equipment automation while improving productivity, safety and cost effi ciency in mining operations. AutoMine Tele-Remote provides func- tionality for smart teleoperation and mon- itoring of a single loader from the safety of a remote location. Sandvik said it is easy to set up, operate and maintain with- out a need for advanced technical skills. Designed specifi cally for quick production area deployment, AutoMine Tele-Remote is particularly suitable for continuously changing mining environments, such as applications with small stopes or for mine development. "AutoMine Tele-Remote makes re- mote loader operating simple thanks to a number of smart system functionalities assisting the operator," said Jarkko Ruo- kojärvi, product line manager–Automa- tion at Sandvik Mining and Rock Tech- nology. "The advanced features — such as automatic steering and predictive wall collision avoidance — ensure easy and smooth operation of the loader, reducing strain on the operator." As the intelligent operator-assisting AutoMine Tele-Remote system automat- ically steers the loader in environments previously unknown to it, loading can start immediately after site installation without a need for area defi nitions. In addition, the solution enables additional productive hours each day by allowing continued remote operation of the loader during blast clearance periods. Equipment utilization is also in- creased as operators can hand over be- tween shifts much faster, without the need to locate and travel to the equip- ment. The intelligent features of the system assisting the operator also help to avoid wall collision damage that would otherwise lead to expensive downtime for repairs and maintenance. This translates into cost savings and higher productivity. The system's com- pact onboard package is integrated into the intelligent control system of Sand- vik loaders, allowing full monitoring and control functionality as well as straight- forward retrofi t installations. Because AutoMine Tele-Remote can be easily upgraded to higher-level Sand- vik load and haul automation, Sandvik claims it is an ideal solution for mines looking for a simple yet powerful way to gain more effi ciency with remote opera- tion as well as for those who may want to take the next step in performance at a later stage. 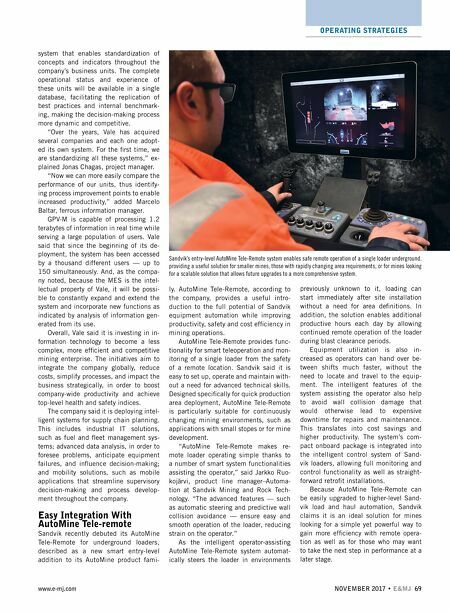 Sandvik's entry-level AutoMine Tele-Remote system enables safe remote operation of a single loader underground, providing a useful solution for smaller mines, those with rapidly changing area requirements, or for mines looking for a scalable solution that allows future upgrades to a more comprehensive system.